Much of the time, we focus on the bad habits we have and struggle to overcome them. Our habit of procrastinating. Our lack of organization. 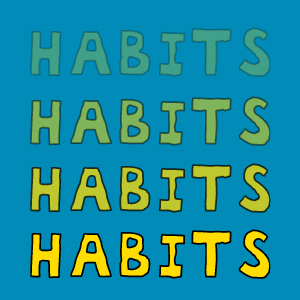 But what about good habits we can adopt that will help us grow our businesses? Try incorporating these five habits into your daily work routines, and you’ll soon see the positive changes. If you feel like there’s not enough time in the day to get everything done at work, try getting up one hour earlier. The additional productivity (in the wee hours, before the phones start ringing) can drastically reduce your workload. You might be surprised at how efficient you can be if you start your day earlier. And if you finish all your work early, take off early and have some downtime for yourself. You set up a growth goal and it’s a huge one. Your team’s eyes promptly glaze over. They are overwhelmed. In a matter of days, you lose sight of that goal in the press of running your business. Goals, shmoals—who cares? You’ve got payroll to meet next week! Before you know it, that goal is a distant memory. Try breaking those goals down into smaller weekly goals, instead of one giant annual goal or even monthly goals. That way, the goals seem more achievable. Better yet, you and your team will get a sense of accomplishment from meeting smaller weekly goals. That will pump up your confidence to tackle more goals. Get in the habit of articulating a big vision, but backing it up by a series of small short-term goals. Adopt the habit of positive visualization. That means envisioning your business the way you want it to be, and drawing that success to you. Let’s say you’re working on a large proposal that would really boost your company’s revenues. You’re actually biting your nails about it, and figure you won’t get it because you’re too small or not experienced enough. Instead, try visualizing that call where the client tells you your company is hired. Imagine depositing that big check into your account. Envisioning positive outcomes will give you more confidence. Do you listen to yourself? I’m not talking about the words you say aloud. I’m talking about that little voice inside always telling you something isn’t good enough or is going wrong. If you’re an old Saturday Night Live fan, you might remember the character Stuart Smalley, the motivational speaker who encouraged us to say, “I’m good enough, I’m smart enough, and doggone it, people like me.” While you don’t have to make your affirmations so cheesy, it helps to have positive self-talk. The words you say to yourself matter. If you have negative scripts or doubts going through your head like a movie soundtrack, such as “This project for XYZ client is going from bad to worse,” or “We’ll never turn a profit,” you’re making it harder to be successful. Being conscious of the negative self-talk is the first step to changing that habit. “Listen” to yourself, and when you catch yourself thinking something negative or even doubtful, replace it with a positive statement. Where do you get the positive statements to replace the negative ones? Get in the habit of reflecting on your successes and celebrating them. Some people take a bowl and put marbles in it for each win, such as a new contract or a positive customer testimonial. The marbles serve as a visible reminder of the successes, and can trigger positive talk. Send an email to employees to let them know of wins, and congratulate team members for their roles in those successes. The act of writing out emails like that will make you feel like the leader of a winning team. And of course your team will feel great, too. The positive winner attitude will start to spread around and become part of your company culture. I know, I know. You’re so busy working in your business, you have no time to work on your business. But you have to make time—time to read articles, industry magazines, blogs or books. Doing so can provide the creative spark you need to generate a new idea or strategy. Set aside time each week to learn, be it from content, video, webinars or conferences. Learn about what others are doing in your industry, as well as how to run and market your business more smartly. Don’t let yourself (or your team) get stale. Like muscles, skills atrophy if they’re not exercised. These five habits can start showing immediate results—in 60 days or less.